As per our Housing License Agreement (that long document you agree to before you complete the Roommate Survey/Housing Application), you must be registered as a full-time student (which means 12 or more credits) unless you are graduating next semester to live in housing. 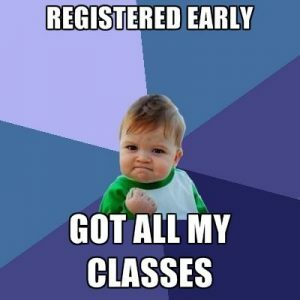 In other words, if you’re not signed up for classes for Fall 2017, you cannot select a room during Room Selection, no matter how many Priority Points you’ve accumulated. Check out the Seton Hall University registration schedule here and do everything you can to get registered for Fall 2017 before it’s time for you to pick a room.